Mid-January is when Mother Nature turns up the dial on winter in most of America and her cousin Lady Luck starts to interfere with college basketball. Teams across the country are being hit by the injury bug (or other unforeseen issues) and forced to find a replacement, change their game plan, or suffer the consequences. This week saw major changes rock four of the nation’s premier teams, each now scrambling for an answers. Each of the four could survive their new reality or get swallowed up by bad luck. To date, the Creighton Blue Jays have played 19 games this season and only lost once, a hard fought game against the #1 team in the AP Poll (Villanova). The Jays have displayed one of the nation’s best offenses, with the 2nd best effective field goal percentage and 7th best offensive rating. Mo Watson Jr. was the straw that stirred the drink. Watson was scoring 12.9 points per game and dishing out a national best 8.4 assists per game. He was assisting on 44% of his teammates field goals, the 5th best rate in the country. Coach Greg McDermott surrounded Watson with shooters like Cole Huff and Kyhri Thomas, along with Justin Patton, an elite finisher at the rim. 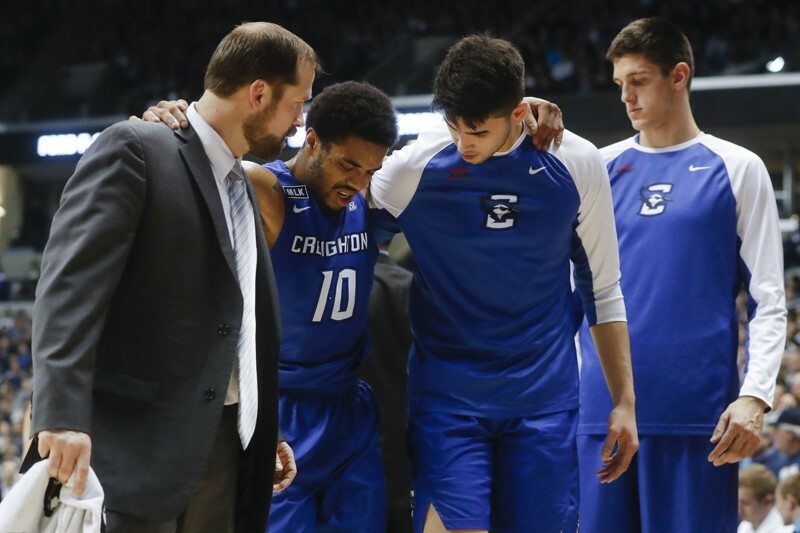 In Creighton’s win over Xavier this past weekend, Watson suffered a knee injury that an MRI confirmed was an ACL tear, causing him to miss the rest of this season. The Blue Jays offense will now need to undergo a serious makeover. Thomas and Marcus Foster will likely handle the ball, neither of which is capable of doing so anywhere near as well as Watson. Foster can create off the dribble and penetrate, but is a shoot first player, currently taking more 30% of Creighton’s field goals when he is on the floor (4th highest percentage in the Big East). Relying on Foster to play Watson’s role would be a fool’s errand. Creighton still has the talent to compete in March, but that would require Greg McDermott to overhaul his entire offensive strategy midseason. He has the puzzle pieces to find something successful. Justin Patton leads the Big East in field goal percentage and has shown ability to beat other bigs down the floor or with a limited set of post moves. Foster is a scorer, even if ineffective, and the rest of the Blue Jays shoot the lights out. If McDermott can find ways to get his players open shots in the flow of the offense, without Watson creating looks for them, Creighton is still alive. If not, their dreams are torn in half like Watson’s ACL. After losing Watson, college basketball’s collective audience didn’t even get a chance to catch its breath before injury struck another endlessly exciting player. Indiana swingman OG Anunoby might just be the most electric athlete playing college basketball. He is fast, agile, and strong. He defends four positions and reeks havoc in the open floor. Anunoby suffered a non-contact knee injury in Indiana’s win over Penn State this week. His status has yet to receive any true update, only that he is out in definitely with a knee injury. (Update: Indiana has confirmed Anunoby will miss the rest of the season.) Assuming that means he is out for an extended period of time, the Hoosiers are hovering near Panic Button Status. Indiana is 13-6, with the losses coming to a few different levels of opponents. Losing to Butler or Louisville on a neutral court is more than acceptable. Losing at Maryland or to Wisconsin at home is also acceptable. Dropping a home game to Nebraska or losing to Fort Wayne? Not the kind of thing future tournament teams do. Indiana has played sloppily all year, posting the 46th highest turnover rate in America. The Hoosiers turn it over on 21% of their possessions, without the pure scorers or defensive ability to make up for those lost possessions. Anunoby was their best chance to offset that issue. His steal rate was third best in the Big Ten and his offensive rebounding rate was top 20 in the conference, a fine mark for a 6’8 swingman. If any Hoosier was going to make a play to earn Indiana and extra possession, it was OG. Indiana now faces an uphill climb through the Big Ten schedule, without their best athlete and defensive player. Seven of Indiana’s remaining 12 conference games will come on the road, and the home slate is no cakewalk with Purdue, Michigan State, Michigan, and Northwestern all scheduled to visit Assembly Hall. If the Hoosiers can even manage 6-6 the rest of the way, they’ll enter the Big Ten Tournament at 19-12 and likely on the wrong side of the bubble. Oregon was off to a hot start this season. Dana Altman’s top seven guys in his rotation are as good as any other team in America. The pieces of his roster are not only talented, but fit together perfectly. Casey Benson is a floor general who conducts the offense, while Peyton Pritchard is a freshman point guard who packs a scoring punch. Tyler Dorsey is both a scorer and a stopper. Jordan Bell is a bullmoose on the glass and a freight train on rim runs. Dylan Ennis is a sixth-year senior and a junkyard dog on defense. Chris Boucher is a stretch four, and I literally mean stretch because he looks like Mr. Fantastic. 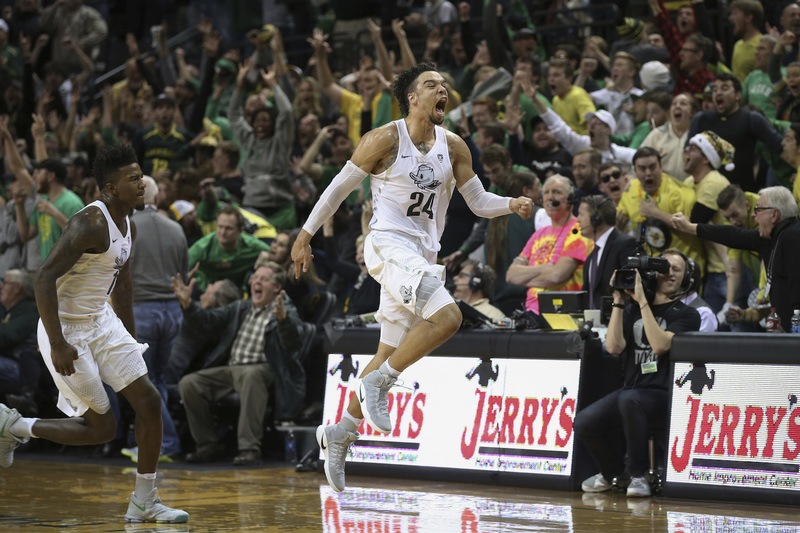 Dillon Brooks is the Ducks’ alpha dog and go-to-guy. He can create for himself and his teammates in a variety of ways, but he left Oregon’s game Thursday night with a knee injury and did not return. The Ducks could lose one of their other six contributors and stay afloat, but losing Brooks would be a brutal blow. Brooks’ leads the Ducks in usage rate and is responsible for 32.7% of Oregon’s possessions. Only 16 players in the nation are more involved for their team, and of that group only one (Michigan State’s Nick Ward) plays in a major conference. Without Brooks, multiple Ducks will need to shoulder the load. Pritchard and Dorsey will need to become not only more active scorers, but more involved in the entire flow of the offense. Bell, Boucher, and Benson can make open shots, but they can’t create for themselves. That trio has made 170 field goals for Oregon this season (excluding putbacks), with a whopping 76% of those being assisted baskets (per Hoop-Math.com). Brooks created many of those looks, with his 32% assist rate. Pritchard and Dorsey are young, a freshman and sophomore respectively, and will need to learn new roles fast. Though often forgot in the age of analytics, losing Brooks’ intangibles also will effect the Ducks. He was the emotional heart and soul of the team. Seniors like Benson and Ennis will need to carry that torch when Oregon is faced with adversity. Brooks played with a swagger that carried the Ducks during crunch time. That’s not easily replaced. Much of his game isn’t replaceable and the Ducks will need to hope he doesn’t miss a long stretch of time. Sean Miller’s Wildcats looked like the best team in the Pac-12 on paper before the season began. Adding freshman foreign phenom Lauri Markannen to a team that made the NCAA tournament as a 6 seed last season looked like a winning combination. 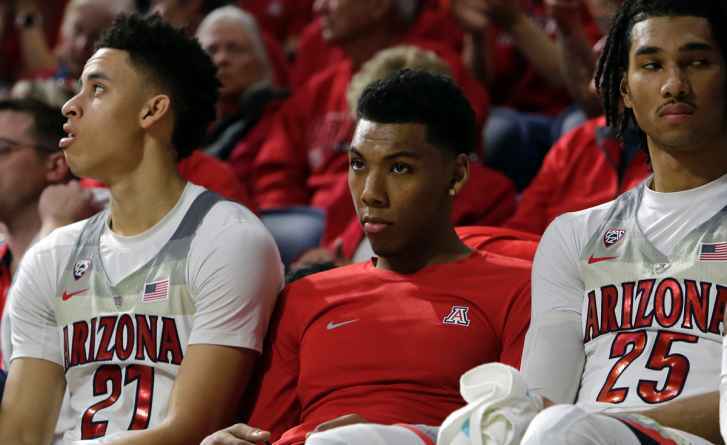 Rising sophomore Allonzo Trier was supposed to be a major factor for the Wildcats, after averaging 15 points per game last year. When Trier didn’t travel to Arizona’s season opener against Kansas, questions arose, but everyone assumed he was dealing with a minor academic eligibility issue or “failure to comply with team rules” (NCAA-speak for a marijuana related offense). Then game after game went by without Trier in the lineup. Most assumed the problem must have been academic and he would have a chance at second semester eligibility. Second semester started and still no Trier. This week, we finally got an answer. Trier failed a drug test, specifically testing positive for a performance enhancing drug. More importantly, we learned when to expect to potentially see Trier on the court again. Trier appealed his failed test and was able to prove he never knowingly took a banned substance (he ingested the substance after an offseason car accident), the NCAA agreed and will allow him to return without a “suspension”, but only once the drug has completely left his system. If you’re scoring at home, Allonzo Trier is not suspended; he’s just not allowed to play at the moment. Admittedly, my knowledge of steroids is low, but three months seems like enough time for a drug to leave his system. Meanwhile, the Wildcats are excelling, but completely under the radar. UCLA and Oregon have receive the bulk of attention in the Pac-12, while Arizona is 16-2 and has only lost to Butler and Gonzaga (at neutral sites). The Wilcats won at USC last night, holding the Trojans to a measly 19 points in the first half. Add Trier to a team playing that well, barring some on-boarding issues, and Arizona begins to look a lot scarier. If he returns and elevates the Wildcats to a new level, there is nothing they can’t achieve this season. Pac-12 title, number one seed, Final Four, and a National Championship are all on the table.